Get started with a professional online presence that puts you on the front page of the internet! If your law firm needs a custom website design or a design revamp, we have got you covered. Our full service website design process is leveraged towards building successful online presence for your law firm. We design and develop websites that generate leads and convert! With over 10 years of experience in this industry, we know exactly what goes into building successful websites for law firms. A great design is just the beginning. We take it to the next level with our well-structured and meticulously well-defined website design process. This is the starting point where we learn about your firm, practice and USPs. We also study your competitors to get a good overview of what works in your direct market. The market research comes in handy for placing you at the top of the search results! 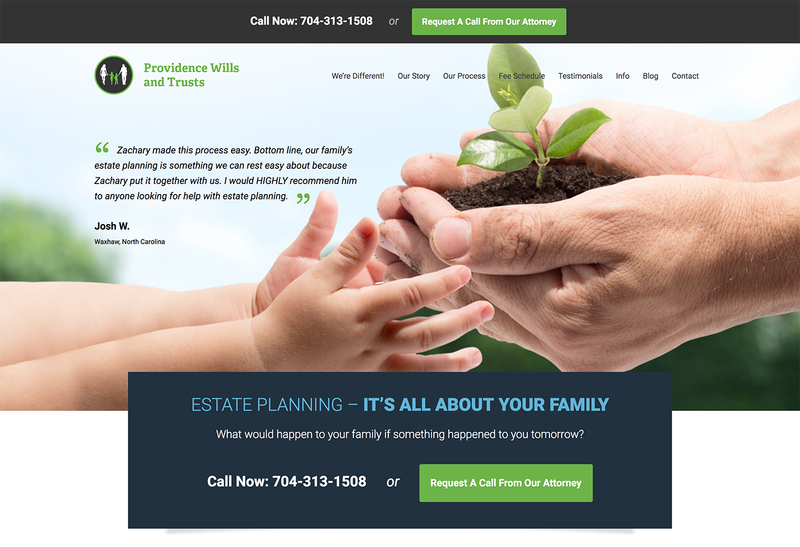 If someone is looking for a real estate lawyer in your city, we want your website to be their first and the only click! The next step is to create a design that is visually impressive, has excellent user experience and converts well. The design phase will help you in finalizing the colors, fonts (typography) and layouts across various views of the website. We will collaborate and work together to build a creative design for your law firm. Once the design is finalized, we go ahead and covert the design into a fully functional website that not only looks good, but generates traffic to your website and converts your potential customers into paying clients. We also make sure that your website is optimized for hiDPI screens as well as mobile devices. We don’t leave anything to chance — we plan and execute for your business success. This is the most crucial step in the process. Everything should look good to the eyes and everything should look good to the search engine bots too. Our websites are built on a solid foundation and in this phase we re-examine everything to make sure that there are no loopholes. We review the design implementation for best coding practices, semantic HTML, structured data and schema and mobile friendliness. The site is developed on our development server and once everything is approved, we migrate the site to the production server. We give you the honor to make the site live — it’s just a click of a button and your website is online. After the launch, our team once again takes over your website to configure caching, setup Google Search Console, integrate Google Analytics, optimize the website for page loading speed and everything that is required for optimizing the performance of your website. Our process and relationship doesn’t end with the launch of the site. We are right here 24/7, 365 days to offer any kind of support and maintenance required for the site. Better yet, make us your marketing partners and we will take care of everything to bring traffic to your website — Digital Marketing, SEO (Search Engine Optimization) and website quick fixes — we have literally got you covered! Over years of working with law firms, we know that to run a successful website in this niche, you need to have some of the following features on your website. If you are an attorney, lawyer or a law practitioner, these are the common features required for running a business website that generates leads & revenue. Steve Wanzek and his team at Convertica Commerce did an incredible job converting my PSD design into the most current version of Thesis on WordPress! His fees were very competitive as well. All said and done, I have not only a beautiful site but a site that is fast and very easy to update, modify, and tweak on my own in the future. Highly recommended!